Indian Defence officials have confirmed another felony by the Chinese army in Arunachal Pradesh's Yangtse region last week, at the same time India's bid for the membership of the Nuclear Suppliers Group (NSG) was blocked by Beijing. Authorities in the Defence Ministry and the Intelligence Bureau said that the felony by nearly 250 soldiers of the Peoples Liberation Army divided into four groups happened on June 9th in Arunachal's East Kameng district, as per Television reports.This was the first felony by the Chinese army this year in that region, as China claims as its territory. 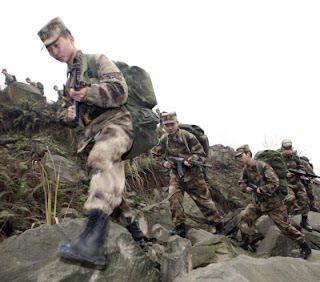 The Chinese soldiers spent nearly three hours on this side of the border before going back to their side. Indian Army has decided to lodge a complaint with the Chinese government which is already in India's cross-hairs following its hostile blocking of India's application for the membership of the elite nuclear club. Both India and Pakistan had applied in May to join the elite 48-member group that regulates global nuclear trade. India has secured pivotal backing for its membership from Mexico, Switzerland, Italy, United States and even Pakistan has been persuade hard to scuttle India's bid.